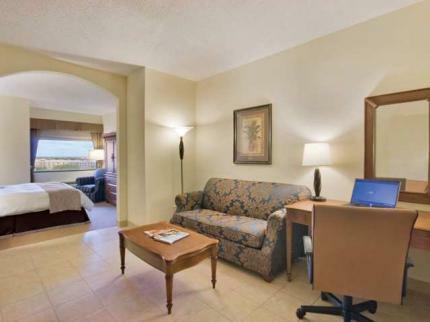 The Doubletree Hotel Palm Beach Airport, centrally located just off of I-95 and Okeechobee Blvd. in West Palm Beach, is less than a mile from Palm Beach International Airport (PBI) and fabulous City Place, one of south Florida's most popular downtown destinations. For our guests' convenience, our full service hotel offers shuttle service to and from the Airport, as well as the many dining and entertainment venues of City Place. The Doubletree offers understated elegance and tastefully-appointed guest rooms and suites that boast a long list of guest amenities, generous work surfaces, luxurious Sweet Dreams Beds, and complimentary wireless high-speed internet access. Order freshly prepared meals in-room or enjoy casual dining at Gecko's Restaurant, serving breakfast, lunch and dinner daily. Don't miss happy hour at Gecko's Lounge, or stop by for a nightcap after catching a movie or concert. Our airport hotel amenities include a heated outdoor pool and whirlpool in a lush, private courtyard and a well-equipped Fitness Center. Jogging paths, lakes and parks are all nearby.For the business traveler, our hotel provides a perfect Palm Beach County location surrounded by corporate campuses and Fortune 500 companies as well as easy access to Tri-Rail and all major arteries connecting south Florida metro areas. Stay connected with complimentary HSIA availability throughout the hotel and productive with our Business Center services. For groups, seminars, business or social functions, the Doubletree Hotel West Palm Beach Airport has modern ballroom and boardroom space that is perfect for your small meeting requirements. Allow our professional catering and banquet services and friendly, professional staff to anticipate your every need.Florida's Gold Coast offers a wide array of year round activities and attractions. Shop, eat, catch a movie, enjoy live music and explore the coolest new clubs - it's all five minutes away by shuttle at City Place where you'll find world class shopping, sparkling fountains and sidewalk caf reminiscent of a European town center. Beautiful, sandy Atlantic Ocean beaches, deep sea fishing, tennis, and golf courses for every level of play are within minutes. Visit the world-famous Norton Museum of Art, attend a concert at SoundAdvice Amphitheater, enjoy Broadway productions at the Kravis Center, or take the family on a Lion Country Safari adventure. From polo fields to NASCAR races, there is something for everyone within a short drive of the Doubletree hotel.Whether you visit the Palm Beaches for business, family vacation, or romantic weekend getaway, our courteous and caring hotel staff looks forward to welcoming you to south Florida with our signature, warm chocolate chip cookie at check-in.